This fruit tea with strong orange taste makes mouth watering, a good choice for iced tea in Summer. TeaVivre's Fruit Tea's make great, low calorie, caffeine-free, refreshing drinks for anytime of the day. Made only from carefully matched flower petals, dried fruit and berries, they all have high levels of vitamins and minerals and – most importantly – taste and smell great! They are all fantastic to drink either hot or iced. 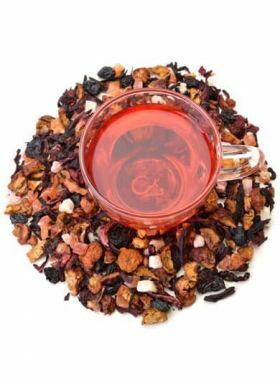 All our fruit teas are made without any added sugar, and so naturally have a very slight sour taste. If you'd like a slightly sweeter drink, simply add a small amount of sugar or, better yet, a small amount of honey.